How to use a Show Lead, Free Baiting, Table Training, Gaiting, Handler Tricks, Stacking, and Show Ring protocol. These photos define the show dog’s topline and the terms used to describe the different backlines when standing naturally, posed, or trotting. First, we have different definitions of “roach”—a very common term used erroneously by GSD detractors. A roached topline is one that (seen in a standing dog) rises from the withers to some point in the thorax-lumbar region, before falling off again in the vicinity of the pelvis. 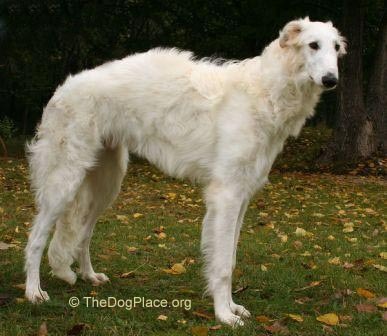 Look at some “overdone” Borzois and, less-commonly, some Greyhounds as in this Borzoi's groomed up roach back, then see the German Shepherd Dog toplines below. Think of a camel when you talk about a roach in canine toplines. In a true roach, there is a region in the topline between shoulder and pelvis that is actually higher. My challenge remains: with that definition, show me a picture of a free-standing dog with a roached backline! What people are actually looking at when they misuse the word “roach” or “roached back” is a two-angled or excessively-sloping topline behind the withers (scapulae). 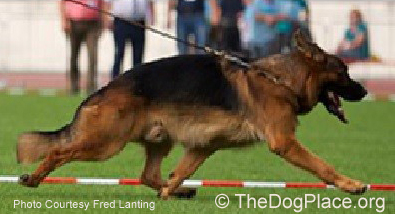 It has become a common problem in GSDs after the early 1960s. Some of these dogs have a noticeable break in what von Stephanitz and the Breed Standard called the correct, level back. And remember, the true back-plus-loin starts just behind the withers (scapulae) and ends at the ilium of the pelvis. It is that part between the bones of the limbs (shoulder blades and pelvis). While there is almost no truly straight line in anatomy, that impression should be given in several parts of the canine body such as muzzle, forearm, metatarsus, lower thigh. As much as we purists might want to see a return to a truly level back, we should be much more adamant about returning to the impression of a straight line, rather than the excessive curve or the two-angled look. That broken-back appearance varies. Some dogs seem to have the sharp break in the topline flow very soon after the withers, others have the noticeable break further back. Some are relatively minor, some truly ugly. Either is fodder for the more vociferous detractors of the modern typical GSD, and I fully understand their angst. What they are complaining about is the most visible, obvious problem that even the most casual observer can see. But there may be equally serious deviations from functional structure and the description in the Standard that they miss. It is easy to see toplines or color, but it takes more education and attention to see the less-obvious but perhaps just as important problems. 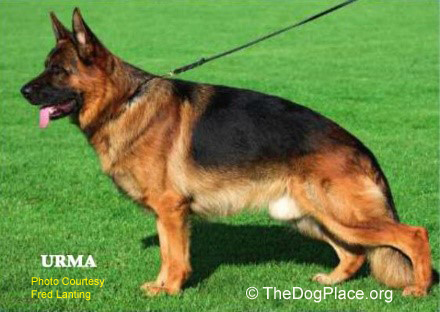 As an example: in the UK, there have long been complaints by the “Alsatian-type-GSD” fanciers about the persistently wrong “broken” or “ski-slope” topline. But they generally ignore the complaint from the other side that too many “Alsatians” resemble Dachshunds because of the ratio of their chest depth and shorter legs. Both groups need to reeducate themselves as much as seek understanding from the other. 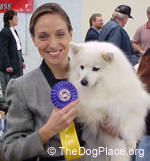 Of the two dogs in the UK photo at right (shows the top winners in the Crufts (UK) competition in 2004). Please ignore the poor posing of the “Germanic-style” dog’s hindquarters but note instead, the ratio of torso depth to total height and to space under the dogs. 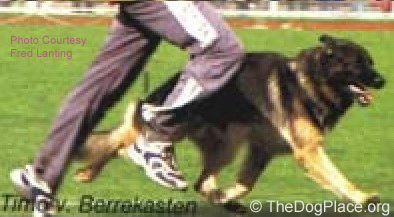 The dog at left in the color photo has correct rear angulation while the dog behind him has an incorrect, nearly horizontal tibia (lower thigh). 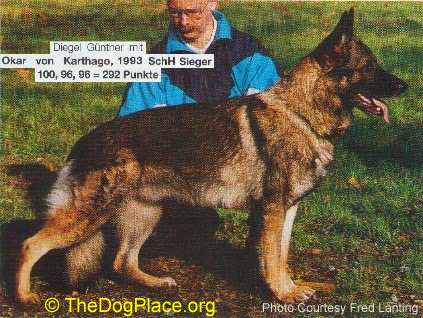 There is between a 50/50 and a 55/45 ratio of withers-to-underline height in the "Germanic" one, but noticeably greater ratio in the other dog. 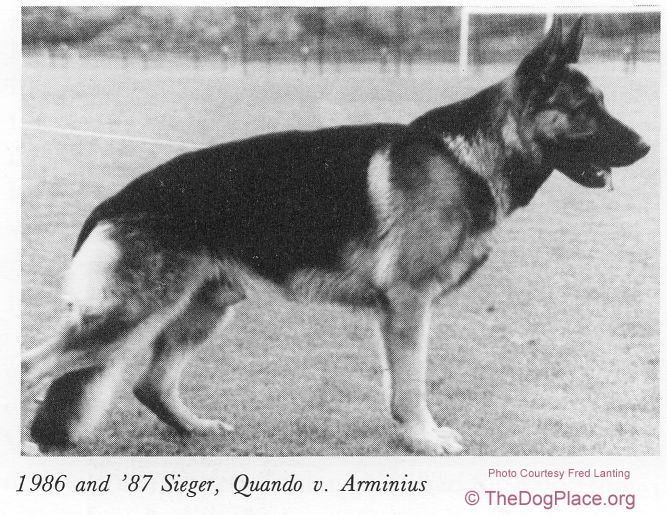 The 1986 Sieger (Quando, at left) shows a more-desirable 50/50 ratio (the impression of a “knick” in his topline is caused by a slight tension on the leash and collar). Now look at the accompanying picture, on the right, of a recent WUSV top winner named Ballack v.d. Brucknerallee. In spite of the SV not giving placing numbers to the top 13 VA (excellent-select) adult males in 2014, fanciers are going to think of him as the Sieger anyway, since he was in front at the final moments of the competition. A handsome, powerful dog, but like any dog he has his faults when you compare him to the official Standard. The proportions of height at withers (directly vertical above the point of the elbow) to chest depth are not quite what the Standard calls for. We see too much chest and not enough leg. Compare the breed Standard's proportions, "the depth of the chest should amount to approximately 45% to 48% of the height at the withers" or even the 50/50 example of Okar Karthago picture on left. Even when Breed Standards do not spell this out clearly, as in the GSDCA and The KC versions, fanciers (and judges!) ought to aim for that ideal. Concentrate on the area of the withers from T1 (first thoracic vertebra) to T2 or T3, where you can feel the tops (“spines”) of the first two or three vertebrae in the thorax. Ignore the almost vertical head-neck carriage of the radiographed dog—that’s only a matter of posing the dog. 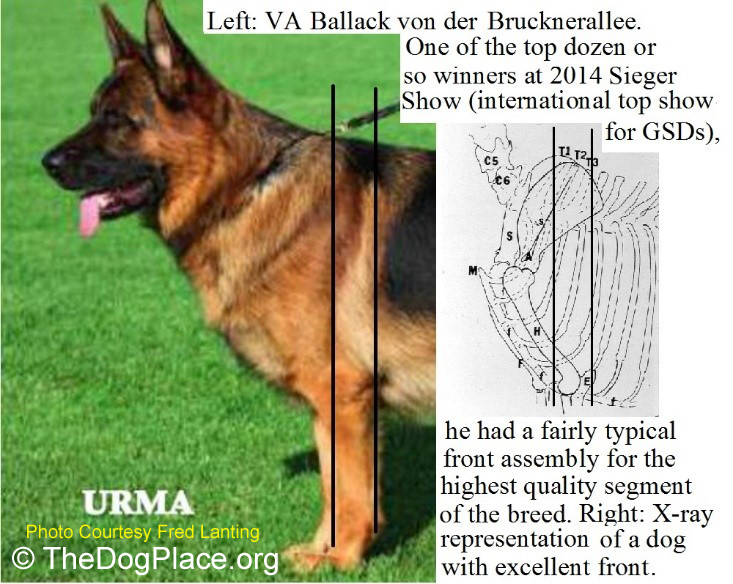 The forward vertical line in each picture represents where many registries such as AKC measure a dog’s height and where the scapulae are level with or slightly higher than the vertebrae. The second line represents where the SV measures height at withers (vertically above the point of the elbow), and is where you can feel the tops of the T3 vertebra and beyond, unless palpation is inhibited by heavy muscling such as is found in most Rottweilers and similar robust mastino types. Next, I call your attention to the photo of Ballack (last photo below) in full-extension fast trot. Good balance of front (shoulder/arm) angulation with considerable rear angulation and fairly long second thigh is part of the reason such a dog can pull ahead of the competition at high speeds. But much of the reason is also training the dog to do so without breaking stride into a gallop. 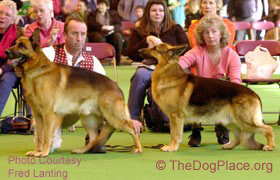 I have trained many a GSD to do this, the great sable Timo Berrekasten (left) was also conditioned to pull out ahead of the competition without breaking from the trot, and if he had been allowed to lead the pack in 2001, he would have floated away from the pack; instead, he was held back by the B&T dog the judge decided to lead the running. Much of the reason for Timo’s second place VA-2 was that his coat-color/pattern was not all that popular. Another thing you should notice in the photo of Ballack (below) gaiting is that the withers (tops of shoulder blades) is lower than the back immediately behind. With full extension (reach)—and increasing with speed—a well-constructed dog who stands with withers higher than the back will trot with the withers lower. The powerful propulsion of the rear limbs will throw the torso more forward than upward, so that the dog will appear to keep a level backline from rear of the scapulae to beginning of the croup. Try this: get on your hands and knees, then extend one arm forward and the other rearward as far as you can—you will notice your shoulders drop in comparison with your back. Better yet, take slow-motion films of dogs trotting faster and faster. 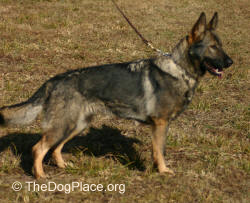 American Show to German Show Shepherds, also Pet to Working types. Roached-wheelback toplines prevalent in the GSD showrings today. 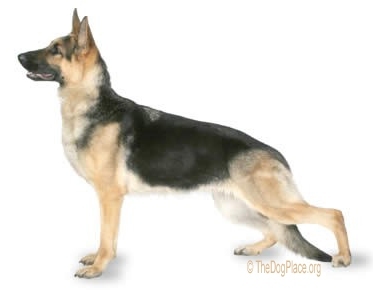 What is a correct topline (back) in the canine and the GSD?